This time of year is one of the best times for people to see Black-tailed Godwits in the UK. During the autumn and winter months our coasts and wetlands support wintering populations of around 43,000 Black-tailed Godwits. These are birds that breed up in Iceland and spend the non-breeding season with us here in the UK. And this winter population is actually increasing. But for the small number of Black-tailed Godwits that actually breed here in England, the picture is sadly a lot less rosy, and it’s this population of godwits that is the focus of Project Godwit and our conservation work through Back from the Brink. One of the female Black-tailed Godwits from the Nene Washes breeding population, pictured in Senegal. The small number of godwits that breed here in England are threatened with extinction, but they spend the winter in warming climes at wetlands in Portugal, Spain and West Africa. We still know relatively little about the timing and movements of “our” Black-tailed Godwits once they leave the breeding grounds and we’ve been trying to fill this knowledge gap through Project Godwit. 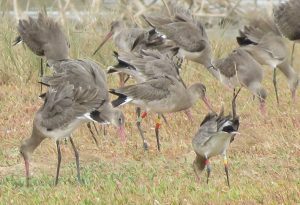 We’ve been fitting Black-tailed Godwits at the RSPB Nene Washes with coloured rings. This allows individual birds to be identified, meaning that we can receive sightings of birds from observers across the flyway. For example, one of our breeding females from the Nene Washes has been seen in Senegal for the last three winters in a row. When she was first re-sighted in 2016 this was the first time a bird breeding in the UK had been spotted in West Africa! As well as receiving sightings from Senegal, France, Portugal and Spain, a number of birds marked under our project have been spotted by birdwatchers closer to home in Norfolk, Essex, Somerset and Hampshire. These sightings are helping us to build up a picture of the sites these birds use when they are outside of the project area. 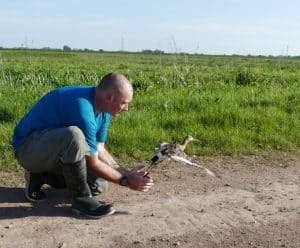 A black-tailed godwit is released after being fitted with a geolocator. Colour ring sightings are fantastic, but they still only provide us with details of where a bird has been at a particular point in time. To build a more complete picture of the godwits movements, we’ve been fitting some of the birds with geolocators. Geolocators are tiny light-weight tracking devices, which can be fitted to a leg-ring or flag. Using geolocators is helping us build a more complete picture not only of the locations these birds are using, but also the schedule of their migration. It’s early days for this work - one of the difficulties of using geolocators is that you have to recapture the bird in order to retrieve the tag – but one of the tracks we’ve been able to retrieve from a tagged bird is shown below. What’s perhaps most striking about these data are the huge distances that the godwits are able to cover in just a matter of days - the female wearing this tag left southern Senegal on the 12 of February and was recorded in southern Spain just two days later on the 14 February.